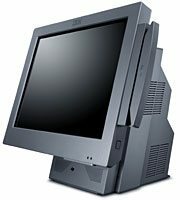 The IBM 4835 Kiosk Model 15W is equivalent to the model 153 except it comes preloaded with the Microsoft Windows XP Professional operating system and has 512 MB memory standard. The model 15W has a 15″ Dual Bulb, Active Color LCD with standard as well as a headphone port and a microphone port. It comes standard with a 2.0 Ghz Intel Celeron processor (or faster) and a 40 GB hard disk drive or larger. The IBM 4835 Model 15W standard features include a 15-inch Active Infrared Touch Screen, a 2.0 GHz processor, 256 MB of memory, 40 GB hard drive preloaded with Windows XP, a Presence Sensor, and Multimedia.